Ten years ago to this very minute, America was assaulted by a form of evil that many were previously unaware of. Over 400 heroes were killed in the terrorist attack, including 72 law enforcement officers. 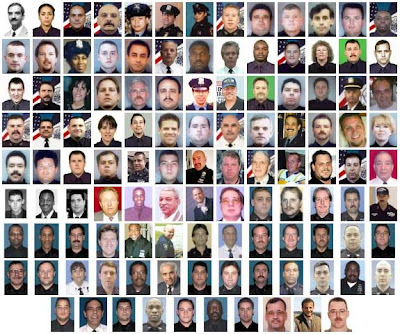 42 more LEOs have passed away as a result of exposure while working at Ground Zero. It was, by far, the most deadly day for law enforcement and all first responders in the history of the United States. Click here to view all 114 law enforcement officers killed as a result of the September 11, 2001, terrorist attacks. While thousands of victims fled the Twin Towers and the Pentagon, having come face-to-face with evil, these heroes ran towards the danger. On the surface it may seem extraordinary, but it isn't. What is extraordinary is that because of first responders across the nation, Americans are able to live peaceful lives often unaware of the many evils that surround us. Law enforcement officers face these dangers every day. Not because it's what they do, but because it's who they are. And that is extraordinary. It's important that we never forget what happened on September 11, 2001. And while we reflect on the 114 officers who gave their lives to the events of that day, let's also remember the 1,582 officers who have died in the line of duty in ten years since then. And, finally, let's thank the law enforcement officers and all first responders that continue to live extraordinary lives on a daily basis.